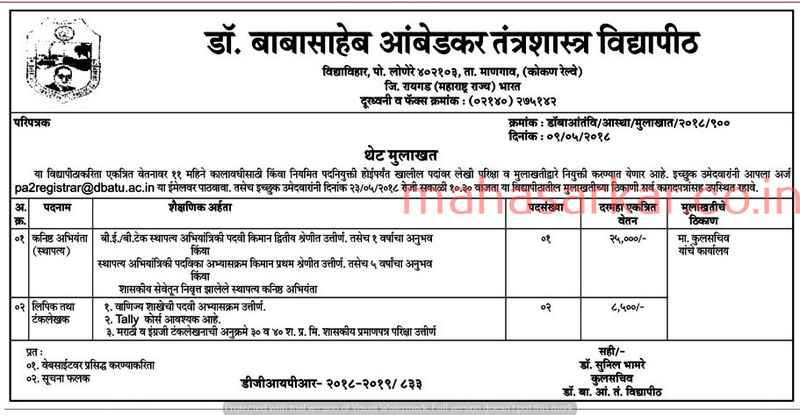 DBATU Lonere (Dr Babasaheb Ambedkar Technological University), Lonere Published Job Notification for 03 Jr. Civil engineer and Clerk Posts. Candidates who wish to apply must look at DBATU Lonere Jr. Civil engineer and Clerk Recruitment 2018. Eligible candidates can apply Offline before 23-05-2018. Interested & Eligible candidates can send their application along with all the necessary documents and testimonials Email to pa2registrar@dbatu.ac.in & then join walk-in Interview at Dr. Babasaheb Ambedkar Technological University , Vidyavihar, Lonere, Dist. Raigad – 402 103, Maharashtra. Starting Date, Last Date to Apply Offline at Dr Babasaheb Ambedkar Technological University which candidates should be remembers as follows. Start Date to Apply Offline: 18-05-2018. Last Date to Apply Offline: 23-05-2018. Walk-in Interview on : 23-05-2018.